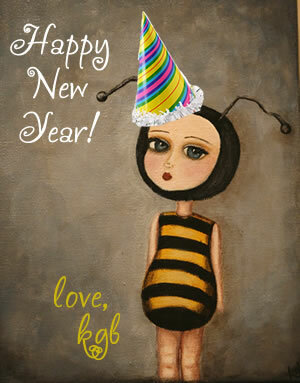 Happy New Year my little bees! I’ve been spending the last few days in a sort of nesting mode – reflecting on 2010, making plans & dreaming up goals for 2011, tidying my space & generally soaking up the quiet that comes after a very busy holiday shopping season. For most retail businesses, online as well as brick & mortar, January & February are very slow months. I’ve seen a lot of folks talking about how to build your sales during this slow period (note to self: do a blog round-up post of the best ones) but for right now I’m content to fully enjoy this slowdown. I want to breathe deeply. I want to visit art galleries & good friends. I want to pull out my sketchbook & paints & allow myself time to create without any expectation or deadline. I want to use these next couple of months to recharge my batteries & find the inspiration that will shape the rest of the year. 2010 was an incredible year for me & for the first time that I can remember, I didn’t want the year to end. Usually I’m quite happy to say goodbye to the year before & excitedly make plans for how I’m going to do things differently in the year to come. I’m not a resolution-maker, exactly. With an ADD brain, making lists – the act of putting pen to paper – is crucial to allowing my mind to focus, so goal-setting (or goal-reiterating) is an all year long pursuit for me. But this year? 2010? It was such an incredible year for me that my plans for 2011 are probably my least ambitious ever. I need to spend some renewal time before my next growth spurt. I need to move my body more. I don’t particularly need to lose weight, but the long hours I spend painting, filling shop orders & making jewelry mean that my lifestyle is getting awfully sedentary. In the summer I ride my bike & play tennis & go on long walks with the dogs, but when it’s cold or rainy (which means pretty much all winter), I don’t do much of anything. The dog-walking shortens to once around the block. I start to feel stiff & sore. My energy level is non-existent. Definitely time to get back into doing yoga. I need to spend more time in the studio. I’m thrilled to be able to make my living creating art, but the realistic picture of what my work week looks like does not often include a lot of art-making. Putting together application packages for art shows, making things like magnets & lockets to sell at craft fairs, going to the post office to mail out shop orders, signing & packaging prints, bookkeeping – all very important tasks for running my business. And all very easily can bump “Paint!” off the TO DO list. Last year my goal was to paint for at least 3 hours a day every single day. I failed miserably. For 2011, I think I need to reshape the goal into something that works better for my lifestyle. Setting aside at least 1 day per week where I do nothing else but paint, for example. No post office. No answering email. No scheduling appointments. There really shouldn’t ever be anything that can’t wait 24 hours to be dealt with, right? Getting better systems in place to handle the rest of my business more efficiently is also part of that process. If the rest of my business was more organized & streamlined, I would have more time to paint. This is also something I want to work on in 2011. To make sure every day starts off with a bit of creativity, I’m searching for some drawing exercises to create a sort of “morning pages for artists” plan. A lot of writers start their day by writing 3 pages. It can be anything. Literally. If you can’t think of anything to write about, you can just write, “I can’t think of anything to write about” over & over & over until it has filled all 3 pages. But the point is, you’re warming up your instrument. You’re writing without editing. You’re loosening up & allowing the words to flow. I want to do this with visual art. Are you setting any goals or intentions for 2011? I’d love to hear them! I love seeing what goals artists like yourself set for the year and how you plan on achieving them. Good luck and here’s to 2011!